In the present great era of reform, when unjust Governments are falling in every quarter of Europe; when religious persecution is compelled to abjure her tyranny over conscience; when the rights of man are ascertained in theory, and that theory substantiated by practice; when antiquity can no longer defend absurd and oppressive forms against the common sense and common interests of mankind; when all Government is acknowledged to originate from the people, and to be so far only obligatory as it protects their rights and promotes their welfare; we think it our duty, as Irishmen, to come forward, and state what we feel to be our heavy grievance, and what we know to be its effectual remedy. We have no national Government— we are ruled by Englishmen, and the servants of Englishmen whose object is the interest of another country, whose instrument is corruption, and whose strength is the weakness of Ireland; and these men have the whole of the power and patronage of the country as means to seduce and subdue the honesty and spirit of her representatives in the legislature. Such an extreme power, acting with uniform force, in a direction too frequently opposite to the true line of our obvious interests, can be resisted with effect solely by unanimity, decision and spirit in the people — qualities which may be exerted most legally, constitutionally, and efficaciously by that great measure essential to the prosperity, and freedom of Ireland — an equal representation of all the people in Parliament. We do not here mention as grievances the rejection of a place-bill, of a pension bill, of a responsibility-bill, the sale of peerages in one house, the corruption publicly avowed in the other, nor the notorious infamy of borough traffic between both, not that we are insensible to their enormity, but that we consider them as but symptoms of that mortal disease which corrodes the vitals of our constitution, and leaves to the people in their own government but the shadow of a name. 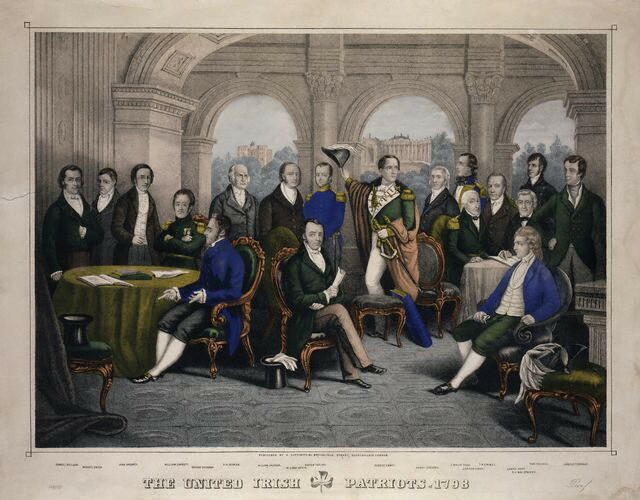 FIRST RESOLVED: That the weight of English influence on the Government of this country is so great as to require a cordial union among all the people of Ireland to maintain that balance which is essential to the preservation of our liberties and the extension of our commerce. SECOND: That the sole constitutional mode by which this influence can be opposed is by a complete and radical reform of the representation of the people in Parliament. THIRD: That no reform is practicable, efficacious, or just, which shall not include Irishmen of every religious persuasion. Satisfied, as we are, that the intestine divisions among Irishmen have too often given encouragement and impunity to profligate, audacious and corrupt administrations, in measure which, but for these divisions, they durst not have attempted, we submit our resolutions to the nation as the basis of our political faith. We have gone to what we conceive to be the root of the evil. We have stated what we conceive to be the remedy. With a Parliament thus reformed, everything is easy; without it, nothing can be done. And we do call on, and most earnestly exhort, our countrymen in general to follow our example, and to form similar societies in every quarter of the kingdom for the promotion of constitutional knowledge, the abolition of bigotry in religion and politics, and the equal distribution of the rights of men through all sects and denominations of Irishmen. The people, when thus collected, will feel their own weight, and secure that power which theory has already admitted to be their portion, and to which, if they be not aroused by their present provocation to vindicate it, they deserve to forfeit their pretensions for ever. The declaration starts off with ” In the present great era” which was 222 years ago and there’s been a lot of change since then. Europe is totally different as are those times of “Revolution”. Powerful language as you say Ed but the only other words in any tongue that never loose their power are contained within thee New Testament. It was as a result of this uprising where Protestants( Presbyterians, Dissenters etc ) and Catholics joined forces against Britain and her minority established Church, that the Orange order came from. After the United Irishmen`s defeat and to ensure there would never be another Religious unity Britain instigated various reforms benefiting Protestants. They also united all Protestant denominations by falsely propagandising against Catholics. There has now been over 200 years of murder ,injury hatred, discrimination and many injustices against Catholics. Britain created this and its their responsibility. Why don’t they use the same force and methods that were used against Irish ,Catholic/Nationalist/Republicans. They wont have to censor the media as nobody will care, except white supremacists neo Nazi and ironically certain Zionist groups. Many are romanticizing or misleading others that as we,re all equal the above declaration applies. Times and events have changed all this. The above declaration was made in an era of social / political Revolution throughout Europe and American Independance. If America were declaring Independence today from Britain would its wording and signatories aspiration`s apply. This all happened 110 years before WW1. Our Irish unity shall never be, until Britain sorts its creation ” Brainless Psychopathic illiterate Loyalist`s ” out. Why this is not happening and never really emphasised except by those Irish who claim, we should all be herded as equals is another concern. The declaration starts off with ” In the present great era” which was 222 years ago and there’s been a lot of change since then. Europe is totally different as are those times of “Revolution”. Powerful ,applicable and just words for Ireland`s self determination , freedom ,of which Irish Republicanism was founded. But the only words that hold power are in within our christian bible`s New Testament. It was as a result of this uprising where Protestants( Presbyterians, Dissenters etc ) and Catholics joined forces against Britain and her minority established Church, that the Orange order came from. After the United Irishmen`s defeat and to ensure there would never be another Religious unity Britain instigated various reforms benefiting Protestants. They also united all Protestant denominations by falsely propagandising against Catholics.The vast majority of Protestants and all Loyalists deny this history as Britain instructed . There has now been over 200 years of murder ,injury hatred, discrimination and many injustices against Catholics. .Britain created this and its their responsibility. Why don’t they use the same force and methods that were used against Irish ,Catholic/Nationalist/Republicans. They wont have to censor the media as nobody will care, except white supremacists neo Nazi and ironically certain Zionist groups. Groups of Irish are romanticizing or misleading others that as we,re all equal using the above declaration as if time has stood still since then. This would be impossible to apply given 200 years of Government endorsed sanctioned denial and Anti Catholicism etc . Times and events have changed. There`s an undercurrent also trying to undermine or diminish this fact by correctly stating the Loyalists were/are used by Britain to do their dirty work. So we are all victims of British injustice. Are we all are equal ?. No, for Loyalists are loyalists are Loyalists are Loyalists sectarian murderer`s . They may have been used but were/are a sadistic psychopathic brainless illiterate weapon . We are nothing to them and any that say so have another Political agenda. The above declaration was made in an era of social / political Revolution throughout Europe and American Independance. If America were declaring Independence today from Britain would its wording and signatories aspiration`s apply. This all happened 110 years before WW1. dictates but is very possible in other non hostile directions. However it will never be until Britain sorts out its creation ” Brainless Psychopathic illiterate Loyalist`s ” out. Why this is not happening and never really emphasised except by those Irish who claim, we should all be herded as equals, is another concern. We are all mainly Christians and as Irish people there is justification to inflict on Protestant Loyalists their atrocities on us. Unite and move forward as one Irish people is Britains responsibility for their creation.